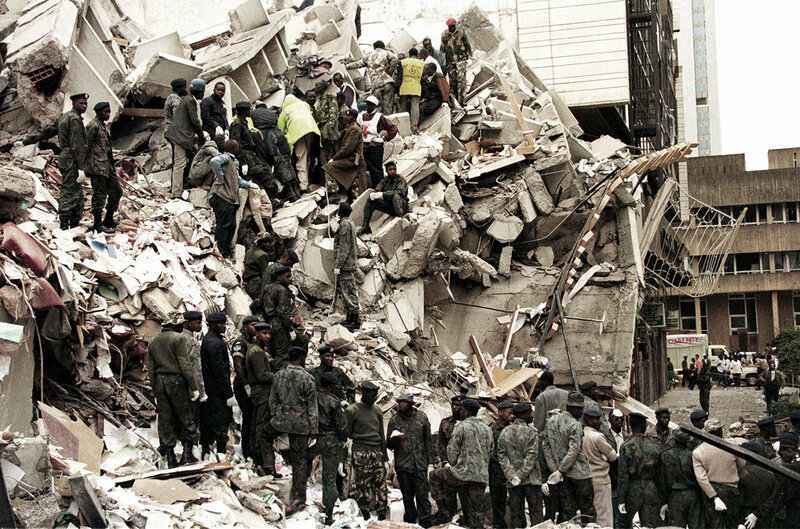 Terrorism, Betrayal & Resilience: My Story of the 1998 U.S. Embassy Bombings. Prudence Bushnell. Lincoln, NE: Potomac Books, 2018. In 2020, American citizens will come of voting age who were not born when the 9/11 attacks occurred. While there are voters who have not lived absent the repercussions of the 9/11 attacks, the proximate cause of American involvement in Afghanistan and Iraq will enter a new age as that attack fades into historical memory. For those who lived through the attacks, the thought that such a horrifying event could fade in public consciousness seems at least shocking, if not an indictment of American culture. But, that critique may be unfair given how easily those who were alive in 2001 had already forgotten the past. The attacks of 9/11 did not occur in a vacuum and the frenetic work of the 9/11 Commission served as much as a critique of the U.S. government as it did of the American people’s ability to forget. Only after 9/11 were events, such as the Battle of Mogadishu and the USS Cole, recalled in the glaring clarity of hindsight. Such hindsight allows Americans to see these events as crumbs along a path to the passenger jets in New York and Washington, D.C. A recent work, however, attempts to remind us of yet another crumb and to contextualize it in light of all that has occurred before and since. Ambassador Prudence Bushnell, who was serving in Nairobi at the time, uses her work to remind the public, again, of the U.S. Embassy bombings of 1998 in Dar es Salaam, Tanzania and Nairobi, Kenya...and why they matter. 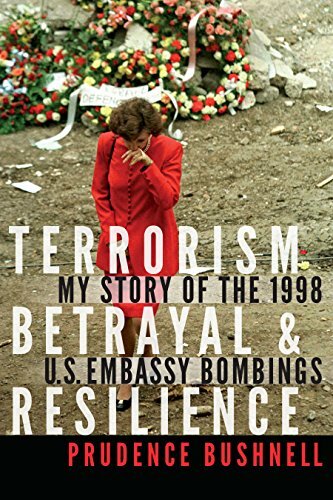 Ambassador Prudence Bushnell’s Terrorism, Betrayal & Resilience: My Story of the 1998 U.S. Embassy Bombings attempts to accomplish much in its relatively slim 224 pages. It is a harrowing tale of her experience of the 1998 embassy bombings. It is a memoir of her attempts to cope in the aftermath of the attack and a catalog of the failings of the US government before and after the bombings. It is an examination of US intelligence failures in combating Osama bin Laden and Al-Qaeda anda biography of her life and career within the State Department’s Foreign Service. It is an ode to her pioneering work as a female ambassador and, just as important, it is a call for a shift in leadership philosophy within the government from a managerial mindset to one of active leadership. Given these tasks, her book sometimes reads a bit schizophrenically and accomplishes some goals better than others. To adequately cover her work it seems best to use her title as a guide. Fittingly, the focus of Ambassador Bushnell’s work is Islamic terrorism generally, and specifically the 1998 embassy bombing in Nairobi where she was posted. The first part of her book, on the experience of the bombing, was perhaps the most effective and arresting section. She successfully conveys the shock and horror of a terrorist attack and the similarly devastating aftershocks faced by the survivors attempting to cope personally and professionally. One particularly strong part of her narrative was her search for a missing colleague, Julian Bartley, in the aftermath of the attacks. Given the chaos it was difficult for her to find out news about this member of her staff. She masterfully weaves the reader into her own personal questioning as to his whereabouts over the course of fifty pages. With one line here or there—reminding the reader that we do not know their status—Ambassador Bushnell humanizes and personalizes the struggles survivors faced. Her own plight becomes that of the reader as we too become desperate to know the answer she was searching for at the time. When she answers the question, it carries weight for the reader because of how she structured her narrative to draw them into the chaos of the bombings. It is poignant and powerful, all the more so given how few lines she had to devote to convey the plaintive search she and others faced in searching for colleagues and loved-ones. If the first section, on the attacks themselves, the work is quite effective. So is the second on the history of Islamic terrorism, and government failings, before and after the embassy bombings. Given that it is liberally cited, along with other post-9/11 memoirs, her book serves as almost a 9/11 Commission Report in microcosm. For those readers who never read the published committee report, it is worth reading in full on its own merits. This section distills the failures that led to successful attacks on the U.S. Embassy where she was posted, the USS Cole, and the World Trade Center (1993 and 2001). If her first section brought forth sadness, her second brought forth anger. For those unfamiliar with the 9/11 Commission Report it will be a particularly difficult section to stomach given the cavalcade of missed opportunities to capture, or at the very least hinder, the work of Al-Qaeda. Bushnell adeptly utilizes her narrative to convey several meanings at once. As she breaks down the progression toward the bombings by year, and then by months or days before the attack, she begins each chronological section by documenting political and cultural events occurring in the United States. From the O.J. Simpson trial to the Lewinsky scandal, she reminds the reader how many other events, serious and banal, consumed U.S. attention throughout this period. To shift, in each section, from a short paragraph on such minor matters to what was occurring with Al-Qaeda, or just as important, what was being missed about Al-Qaeda by U.S. officials, makes for a harrowing read. But, for all the anger engendered by this section, it serves as a fitting reminder of how easily U.S. attention can focus on local issues instead of those occurring half a world away in Sudan or Somalia. It may also serve as a fitting rebuke for those who judge too harshly the pre-9/11 world; the reader is given pause wondering what is being missed today as U.S. attention is consumed by the exploits of celebrities or the newest tweet by political leaders. These two sections, forming the majority of her text, are probably the most effective of the entire book. If readers will feel anger and a sense of betrayal as citizens, Ambassador Bushnell catalogs this sense of betrayal on a personal level. She felt responsible for the 213 dead and 5,000 wounded in the attack on her embassy in Nairobi. Worse, it was an attack she believed could have been prevented. While the attack was shocking, it was all the more galling for how predictable it was. She recounts how she strove, time and time again, to warn those in Washington as to the poor placement of the embassy in Nairobi and of the security risks that entailed. Unfortunately, rather than being heard she was labeled as a problematic and nagging member of the Foreign Service. As she was reminded, time and time again, there simply wasn’t any money. As Assistant Secretary for Administration Pat Kennedy commented in the aftermath of the attacks, “Unfortunately, we simply lack the money to respond immediately to all the needs of embassy construction. Just like, I guess, a family with limited resources, we need to have a priority ranking of how to spend our money.” In this case, the bureaucracy, which always expands to meet the needs of the expanding bureaucracy, could not expand to protect her embassy or her people. In this case, the bureaucracy, which always expands to meet the needs of the expanding bureaucracy, could not expand to protect her embassy or her people. Her sense of betrayal goes beyond the attacks to how Washington treated her people afterward. When reading of bureaucratized decision-making—from Congress refusing to send money quickly enough to aid the Kenyan government, to the government’s plan to remove the marines providing perimeter security under the belief that as her embassy had already been attacked it would not be targeted again—the reader cannot help but feel the same anger she did. Readers, therefore, can take a measure of glee in her use of her public image to force the government to act. Upon hearing the marines would be removed she, “informed [her] colleagues in a low and calm voice that…everyone in Washington would see [her] on international CNN, tears streaming down [her] face as [she] waved good-bye to the brave boys in camouflage.” Such a threat ensured the marines would stay. But such victories were rare and could not outweigh her loss in learning, only after the attack, how turf wars and walls between agencies prevented her people from being protected as they should. Her work is not just a catalogue of failure, however, but one of personal and professional resilience. Indeed, up until the bombing took center stage, her whole career could be seen as a shining example of a woman pushing ahead in a male-dominated field. She was the daughter of Foreign Service workers, living in Germany and Iran, and felt compelled to join the Foreign Service after the 1979 attacks on her former home, the U.S. embassy in Iran. By 1984 she had become the first female administrative officer, serving in Mumbai, and within a decade was acting assistant secretary of the Africa Bureau. This experience led her to be posted to Nairobi, the largest mission in sub-Saharan Africa, in 1996. If such a personal journey took her to the height of the State Department ranks, she was open about her own struggles in the aftermath of the attack. She relates her struggles with survivor’s guilt and post-traumatic stress disorder. She documents how she healed by helping those who were attacked in the Oklahoma City Bombing and the establishment of a memorial to those killed in the Nairobi attack. If there is just one critique, it is that Ambassador Bushnell often presents herself as a modern-day Cassandra. She often paints herself as the singular figure fighting against the bureaucracy in Washington, against the murderers in Rwanda, and even alleges her luggage may have been stolen after her posting in Guatemala because she was such a thorn in the side of General Ortega Menaldo. Nothing suggests she is moving beyond the truth, but the consistent positioning of herself as the brave, and nearly always lone, fighter for justice leaves the reader worrying this attitude may have colored some of her interpretations. Indeed, sometimes this leads her to make seemingly uncharitable critiques. She critiques Sandy Berger and Madeline Albright for coming into power and focusing “on those aspects of foreign policy that interested them,” which seems less a critique and more a statement of how humans operate. She also glides past some of her own actions that might warrant sterner critiques in the hands of a different author. In the aftermath of the raid on el-Hage’s house, when she didn’t press the Kenyan government to allow U.S. agencies to interview captured subjects, she objects that someone else should have told her the importance of the investigation. While she correctly notes that the context of the raid wasn’t passed along to her, it rings somewhat hollow as a defense given her Cassandra-like visage throughout the rest of the book. Again, her failing at that point, and indeed the horror of all of the failings leading up to 9/11, is that it is so understandable. It is understandable that she wouldn’t press the Kenyan government and just as understandable that the CIA and FBI would not share information with each other. Such failings are only revealed with the benefit of horrible hindsight. That minor critique aside, her memoir serves as a powerful work laying bare what it is like to experience a terrorist attack. It also serves as a fitting warning of our need to learn, and sadly often re-learn, the lessons of the past to prevent future failures from occurring. Robert H. Clemm is an associate professor of strategy at Air University. His dissertation, “Delineating Dominion: The Use of Cartography in the conquest, conception, and control of Eastern Africa,” is a trans-national comparative study of the use of cartography by Germany and England in Eastern Africa from 1844–1914. The views expressed are the author’s alone and do not reflect the official position of Air University, the U.S. Air Force, the Department of Defense, or the U.S. Government. Prudence Bushnell, Terrorism, Betrayal & Resilience: My Story of the 1998 U.S. Embassy Bombings, (Lincoln, Nebraska: Potomac Books, 2018), 53.